New Winter 2018: Let your favorite dancer know that he or she is a winner with the ballet trophy personalized ornament that is perfect for Christmas or the completion of a recital or performance. This dancing trophy personalized by hand in a font more stylish than shown glitters gold and blue and will light up the eyes of any recipient. 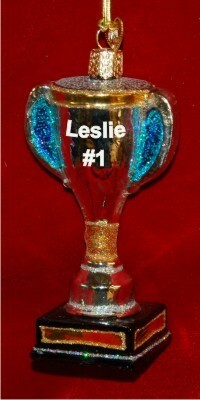 It’s a flexible winners cup trophy, so it works for any type of dance, sport, academic success or even to give to best friends. Celebrate success wherever it happens with a sparkling gift, the ballet trophy personalized Christmas ornament that’s right for any occasion.